After returning from a week working with Force Blue (https://forceblueteam.org) in Key Largo, I returned home and fully expected to have a few weeks before my next project. 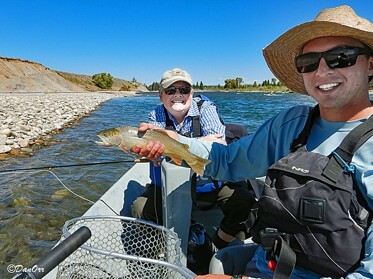 With the summer seeming to go by way too quickly, Betty and I decided to treat ourselves to a day of photography in Yellowstone National Park followed by a day of fly fishing on the Snake River. 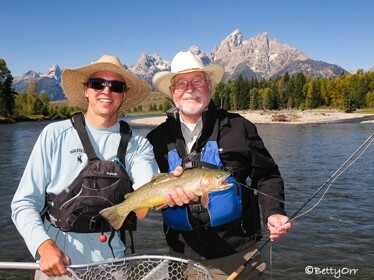 We chose to drift the section of the Snake River that flows through Grand Teton National Park. This section, from Deadman’s Bar to Moose, has some of the most spectacular views of the Tetons and is also well known for the abundance of Cutthroat Trout. It turned out to be one of those beautiful blue sky days coupled with an excellent day of fishing. The fish were actively feeding and we caught (and released) approximately 20 trout with a few that were “remembered” fish! 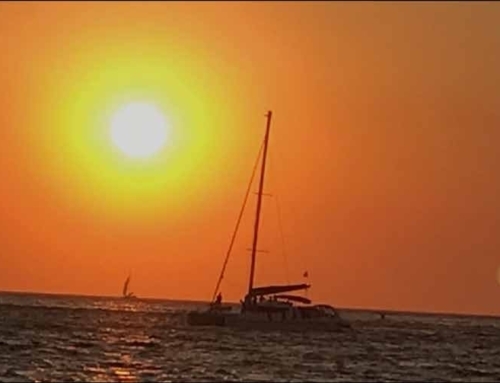 As the following week progressed, I had a conference call with the Diving Equipment and Marketing Association (DEMA) Board of Directors followed by a meeting of the local Geotourism Center Board of Directors (I’m the Chairman of that Board). 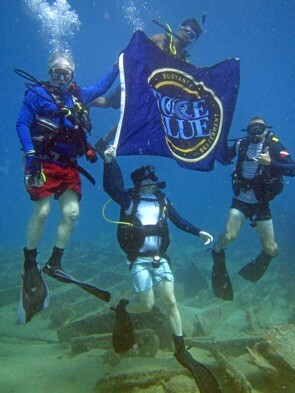 Later that week, as Coordinator, I hosted a teleconference for the Recreational Scuba Training Council (RSTC). Once in Reykjavik, we stayed overnight at a hotel in the City Center. Since our flight into Reykjavik arrived early in the morning, after a short nap, we did a bit of exploring and visited the Settlement Museum which showed an active excavation of an early habitation site along with a pictorial history of Iceland. We located the place where we were to meet a bus to take us across Iceland to the western port city of Akureyri. 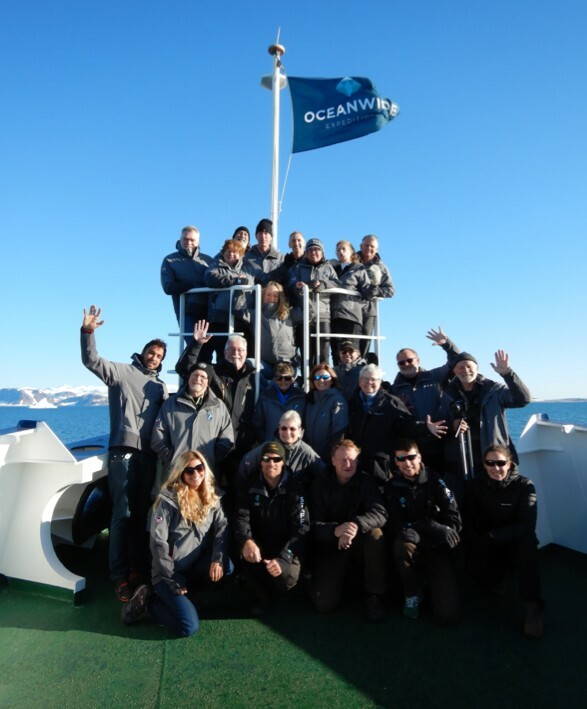 The bus was provided by Oceanwide Expeditions (the same company that we went with to Antarctica in February). The five-and-a-half-hour bus ride through the Icelandic countryside showed us how beautiful this country was. 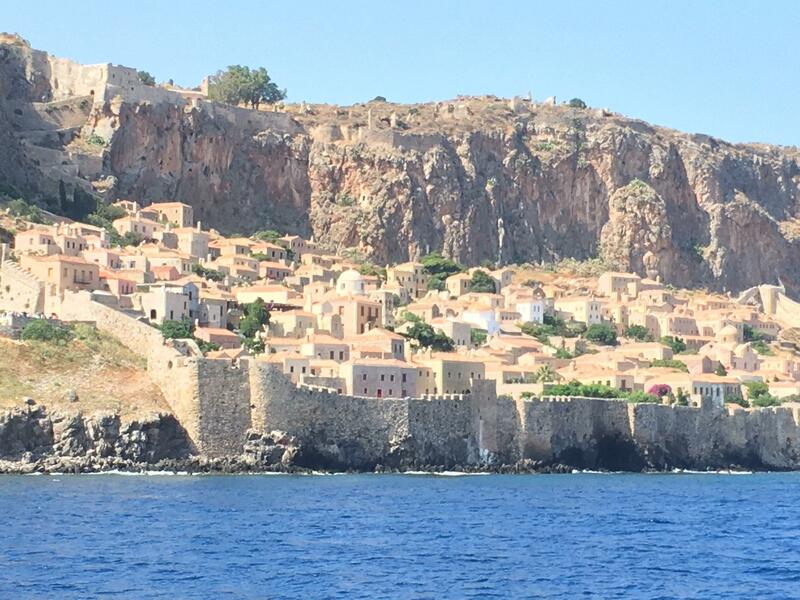 This was an interesting trip for me since I had heard stories from my father who had spent time here in World War II. He was in the Navy and took part in protecting convoys as they crossed the North Atlantic. There was a tremendous amount of convoy activity supplying critical material to Great Britain. and encouraged exploratory voyages into the Arctic. The Plancius was built in 1976 as an oceanographic research vessel for the Royal Dutch Navy and was named “Hr Ms Tyderman.” It remained active with the Dutch Navy until 2004 and was, subsequently, purchased by Oceanwide Expeditions. 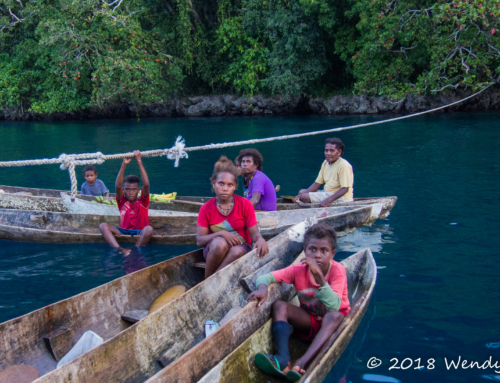 After an initial orientation and lifeboat drill, we went to our cabin and settled in for a thoroughly exciting voyage to a part of the world that we had never dreamed of seeing. As with our trip to the Antarctic, this trip was labeled an “expedition.” It was an expedition because we’d be given an opportunity to explore places where no one had dived and snorkeled before. A rare opportunity indeed! After departing the harbor at Akureyri, we headed out to sea to cross the historically- significant Denmark Strait. 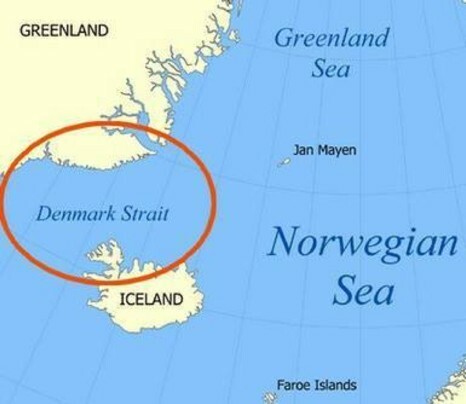 The Denmark Strait is where a famous battle took place during WWII. The Battle of the Denmark Strait was a naval engagement on 24 May 1941 between ships of the Royal Navy and the German Kriegsmarine. The British battleship HMS Prince of Wales and the battlecruiser HMS Hood fought the German battleship Bismarck and the heavy cruiser Prinz Eugen, which were attempting to break out into the North Atlantic to attack Allied merchant shipping. In the battle, the HMS Hood was completely destroyed with the loss of all but three of the crew. The battle was considered a tactical victory for the German Navy but its impact was short-lived; the damage done to Bismarck’s forward fuel tanks forced the abandonment of the breakout and an attempt to escape to dry dock facilities in occupied France, producing an operational victory for the British. Incensed by the loss of Hood, a large British force pursued and, ultimately, sank Bismarck three days later. An interesting note about the Prinz Eugen. It was captured at the end of WWII and taken, intact, to the Kwajalein Atoll in the South Pacific to be used in the atomic bomb tests in Bikini Atoll. The Prinz Eugen survived two atomic bomb blasts and was towed back to Kwajalein in order to determine why she did not sink. Once in the lagoon at Kwajalein, a storm struck and the Prinz Eugen rolled over and sank. She now sits upside down in the lagoon at Kwajalein with her stern and propellers out of the water and her bow in 150’ of water, still fully intact. 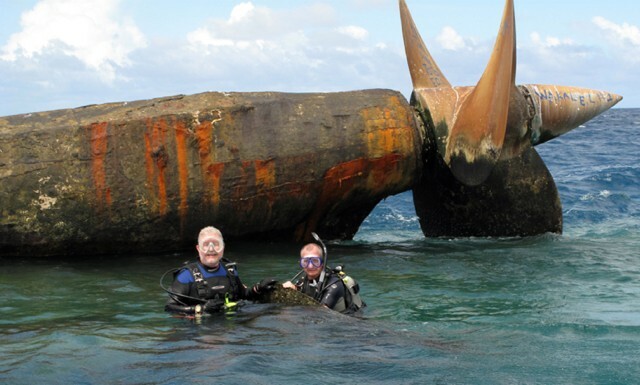 I had the pleasure of visiting Kwajalein and made a dive on this magnificent wreck and relic of WWII. 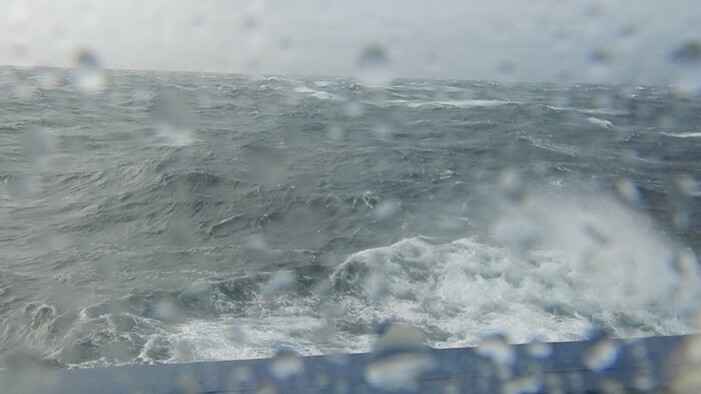 Our trip across the Denmark Strait was a rough one, indeed. We awoke to 20’+ waves and a strong 40 knot headwind with gust up to 63 knots (1 knot shy of hurricane force!). Due to extreme weather, all of the “mandatory” guest lectures and ships drills were cancelled and all outside decks were closed. Despite the bad weather, the dive group decided to hold their dive briefings and regulator configuration activities. 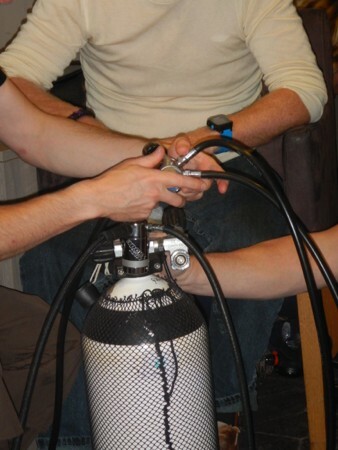 Since the divers use “H” valves to accommodate two complete regulator systems for extreme coldwater diving, it is important to make sure that the two regulators are configured in such a way they are completely functional without interfering with each other. This can be a difficult exercise under calm conditions but is a real challenge when the ship is wildly rocking and pitching. 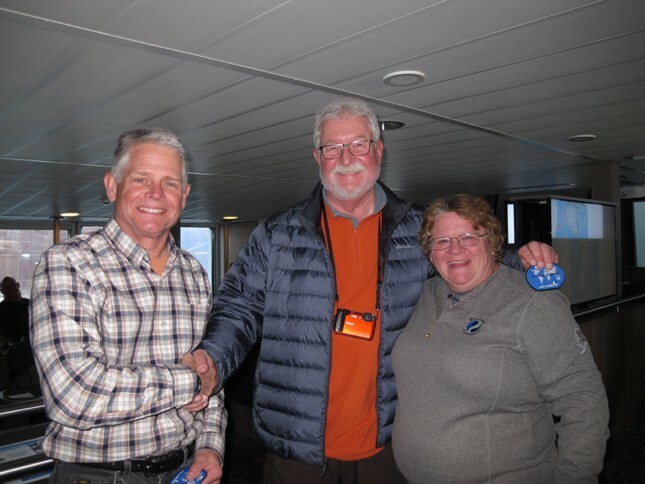 Following the regulator configuration and briefing by the dive staff, Faith and I met with the leader of the dive staff, Henrik Enkel and the ship’s physician, Dr. Lise van Turenhout, to discuss how to manage a diving emergency. Following the meeting, I discussed the importance of emergency oxygen first aid for diving emergencies with the doctor and gave her a copy of a report I’d submitted to Oceanwide Expeditions and the crew of their other expedition vessel, the M/V Ortelius during the trip to Antarctica. 1,970 ft. in the main basin, but depths increase to up to over 4,700 ft. in some fjords. Once inside the Sund, conditions improved dramatically and we enjoyed our first glimpse of Greenland. Like parts of Antarctica, it is starkly beautiful with snow and ice covering most of the landscape. 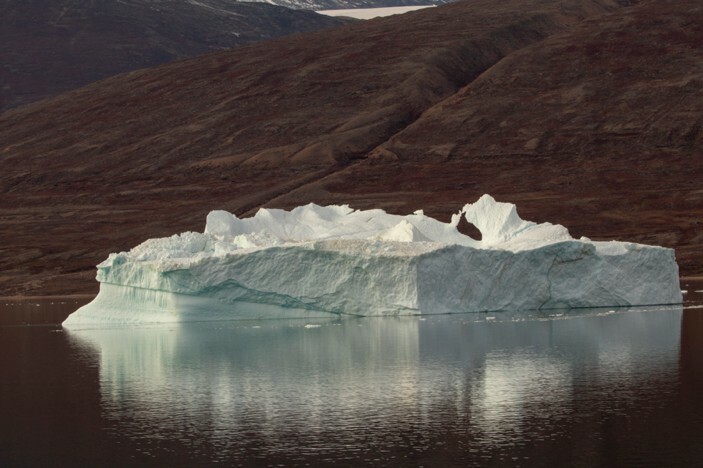 Glaciers were around every corner and icebergs, some the size of a football field floated all around us. As we neared the end of one of the fjords, the announcement came that a Polar Bear had been sighted along the nearby shoreline. “Nearby” turned out to be a relative term. The bear was spotted with some difficulty well over a mile away foraging along the shoreline. 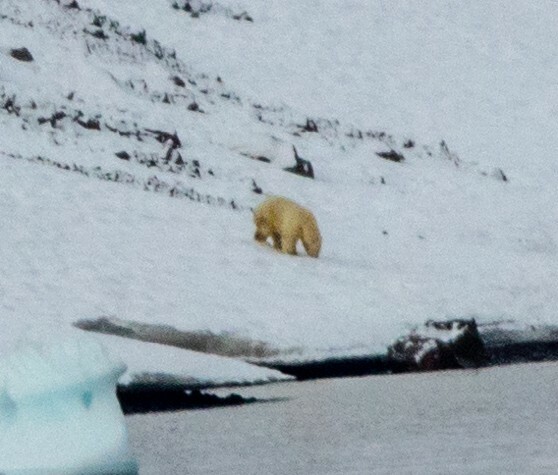 Shortly thereafter, we spotted a second Polar Bear emerging from a den on a snow-covered hillside. The relative scarcity of wildlife was attributed to the face that those living on Greenland hunt these animals and they are very wary of humans. 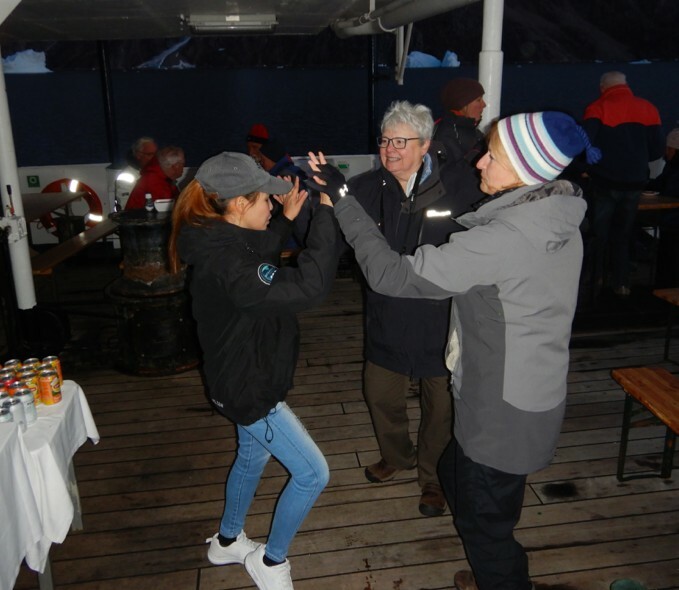 That afternoon, the ship conducted a Zodiac tour of the fjord. We saw lots of fascinating ice formations and colorful lichen grown on the rocky shoreline. During the expedition, Richard Salas (www.askphotography.com), professional photographer gave lectures on proper underwater lighting, the use of Lightroom for photo processing and even gave Betty and me some personal instruction on the use of a histogram when taking digital photographs. I have known Richard for a number of years and, besides being a brilliant photographer, he’s a great guy to spend time with. 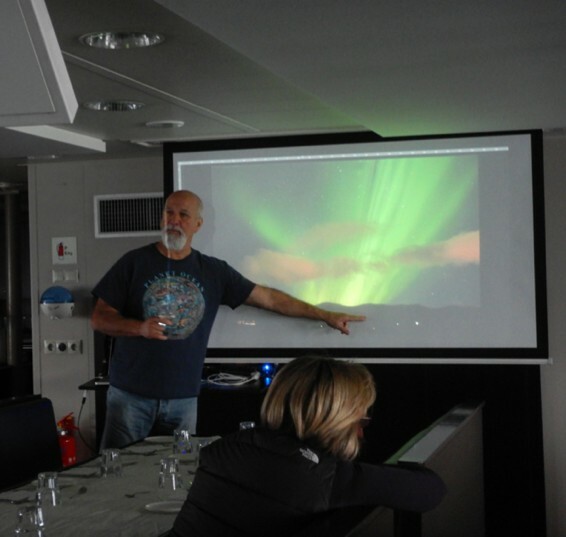 The next day, the divers met for a briefing on the first dive to be made in Greenland. 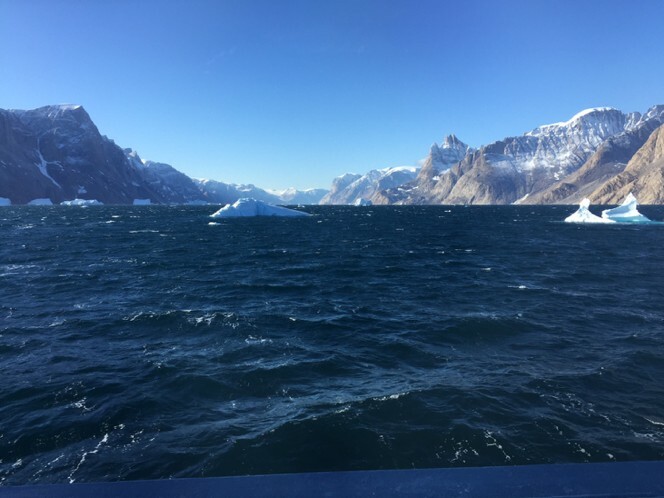 We were in an area that the Oceanwide team had visited before but the exact locations of the dives to be made were around icebergs in an area not dived before. Because I have been plagued with continuing problems with my left knee (since our trip to the Philippines in April and May of this year), I consulted with my physician and we decided that it would be best for me just to snorkel and not risk scuba diving. 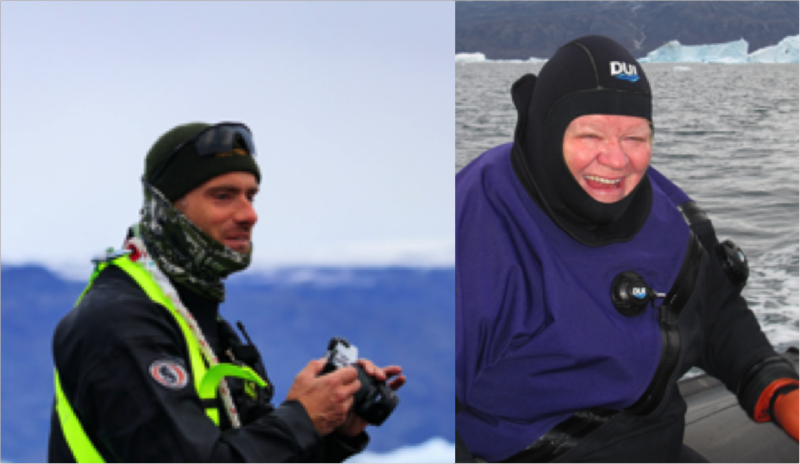 Faith had arranged for me to use a DUI dry suit and I assisted the divers during their pre-dive preparation and then joined them in one of the Zodiacs for a trip out to a group of icebergs. 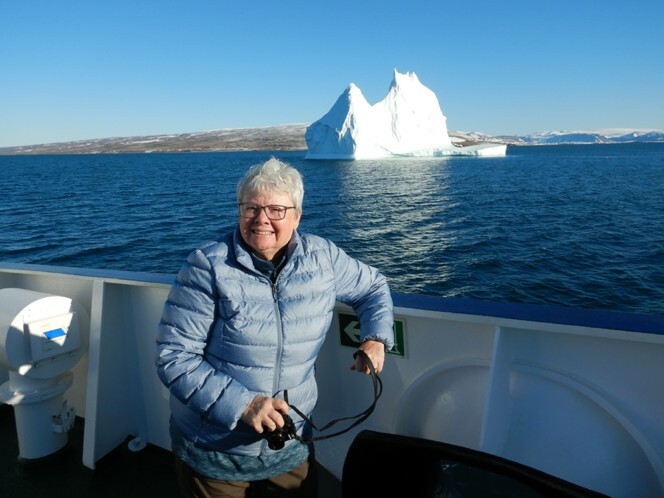 After the divers in my Zodiac rolled backwards into the near-freezing water, I slipped over the side and enjoyed some really spectacular visibility around a moderate size white iceberg. One of the divers, Adam, experienced some technical difficulties elected to remain on the surface with me and we enjoyed swimming around the huge chunk of ice. A short distance away, we simultaneously spotted a small iceberg that was made of perfectly clear ice. We swam over to it investigating every facet of it while Betty and Adam took photos. 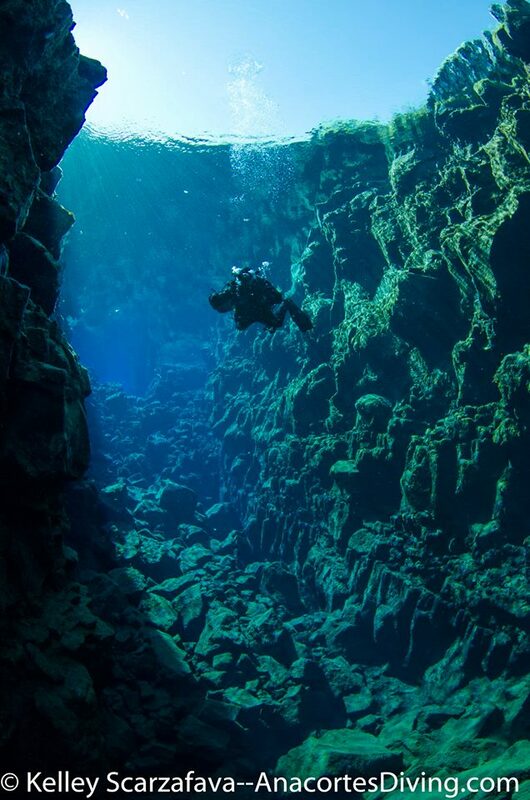 Over the next few days, the dive team would make numerous dives on icebergs, rock walls and sandy bottoms. They came back with exquisite photos of a variety of marine life including Lion’s Mane Jellyfish, Comb Jellies, Nudibranchs, Lump Sucker Fish and other residents of some of the most forbidding environments on the planet. Some of the icebergs we saw with massive and easily dwarfed the Plancius. 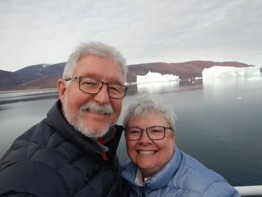 I would estimate that some of these icebergs were the size of a small city being many hundreds of yards long and extending hundreds of feet below the surface. 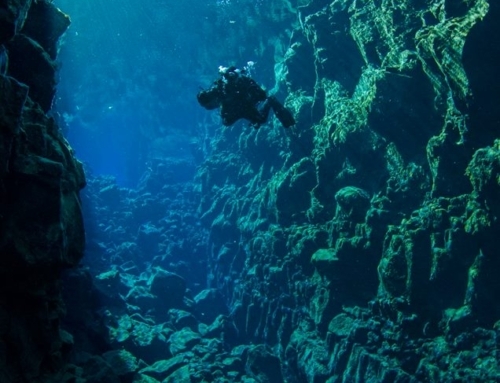 The divers made one or two dives every day and even though I could not dive, I was there to lend a helping hand when they were suiting up and returning to the Plancius. On one of the last dive days, we decided to take a group photo with all the divers standing on a small, and very stable, iceberg. 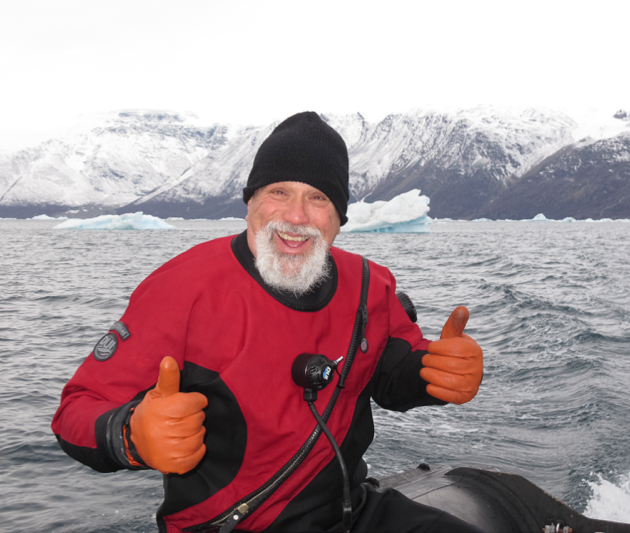 While on the iceberg, I held a copy of Dive Training Magazine, while Betty took photos of the group from a Zodiac. We are going to send the photo to Dive Training Magazine for possible inclusion in the “SAY CHEEZ” section of the magazine. After the photo was taken, the divers made a wall dive nearby and Betty and I joined a shore excursion that did a hike looking for remains of an old settlement. challenges from other guests, we decided not to go swimming in the 32-degree water! The Arctic Polar Plunge was not nearly as popular with only a single guest deciding to chance a swim in near freezing water! We, once again, made what we considered the intelligent choice and stayed warm and dry. 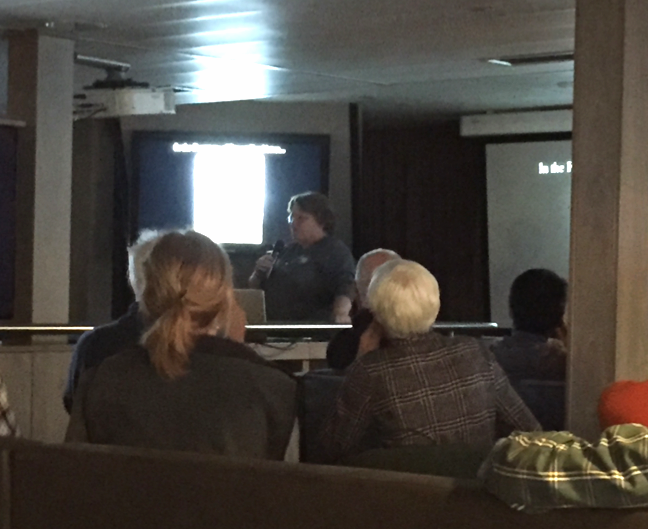 One evening, our host, Faith Ortins, did a presentation on the Antarctic including information on Ernest Shackleton’s Trans-Arctic Expedition (1914-17). I had fulfilled the requirement to be “Bi-Polar” in less than 1 year. A feat that has been accomplished by fewer than 2,000 people. 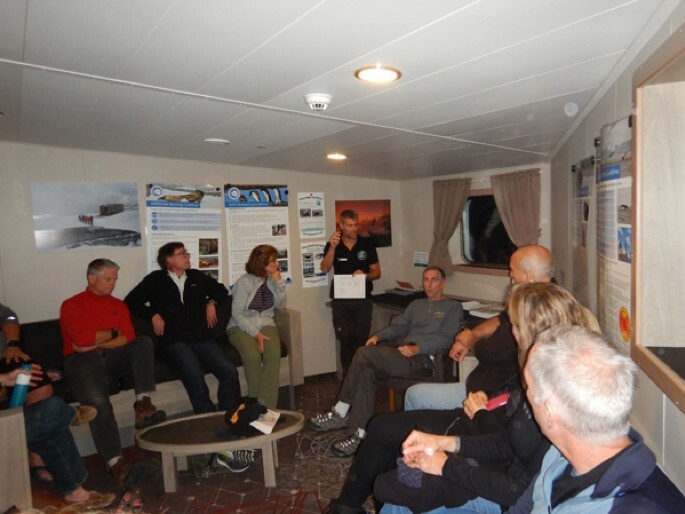 Faith gave another lecture at the end of the trip showing all shipboard guests what the divers had seen and experienced during the trip. As with her presentation on Antarctica, her presentation was extremely well received. We experienced some clear nights as we made our way through Scoresby Sund giving us an opportunity to see the Aurora Borealis (Northern Lights). They were tough to photograph onboard a moving vessel but just seeing this spectacular heavenly phenomenon was enough for us. 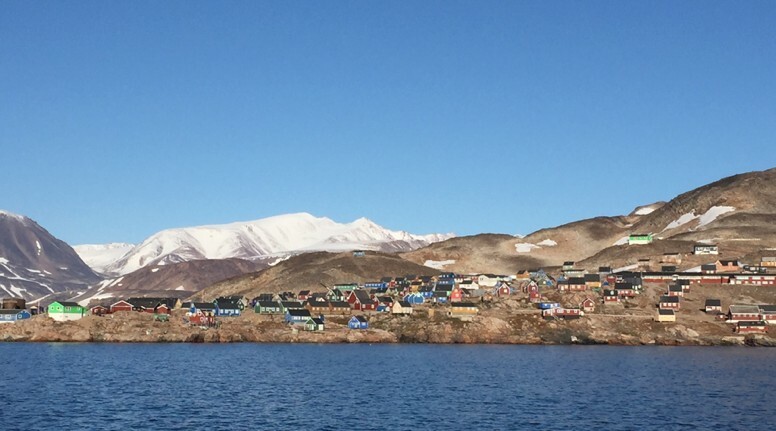 As our trip neared its end, we made a landing at the Greenland village of Ittoqqortoormiit. 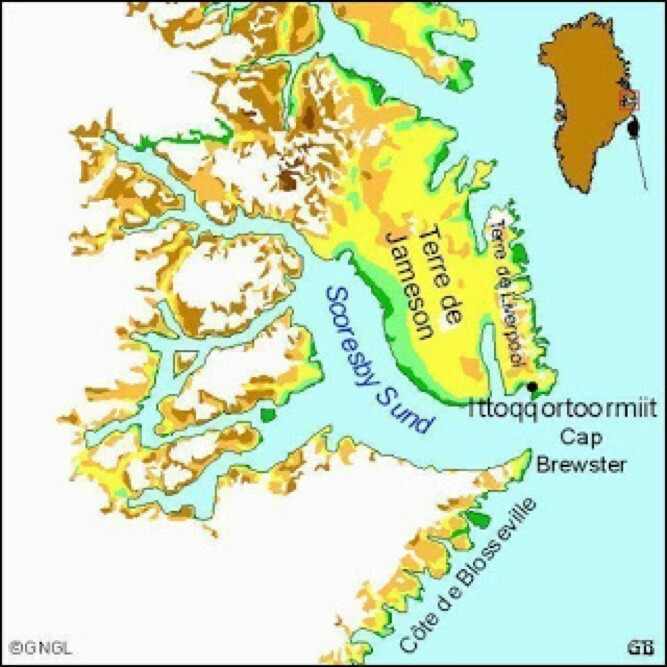 This rugged village of fewer that 500 people clung to existence on the rocky hillside near the opening of Scoresby Sund. We had our passports stamped by a Greenland official and we wandered through the village stopping at the Visitor’s Center. Some of the guests sent postcards about bought local souvenirs. 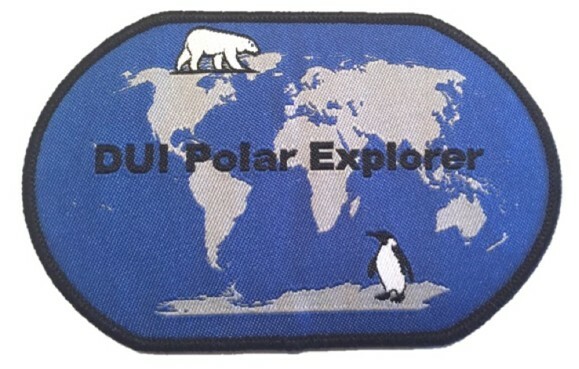 We were warned not to purchase items that were illegal to bring into the U.S. such as whale, walrus or polar bear products. Most of the male villagers were gone during our visit. They were out hunting for seals in a nearby fjord. The village was picturesque with brilliantly colored houses. There were sleds on the roofs of some houses and even the skin of a polar bear drying outside one house. During our time in Scoresby Sund, we met up with another Oceanwide Expeditions vessel, the M/V Rembrandt. This sailing ship spends months in Scoresby Sund each year with groups of guests flown in to a local village to explore Greenland during a 7-10 day cruise. As it turned out, the Rembrandt was low on provisions and was badly in need of replenishment. We took some time out to share our food stores with them. 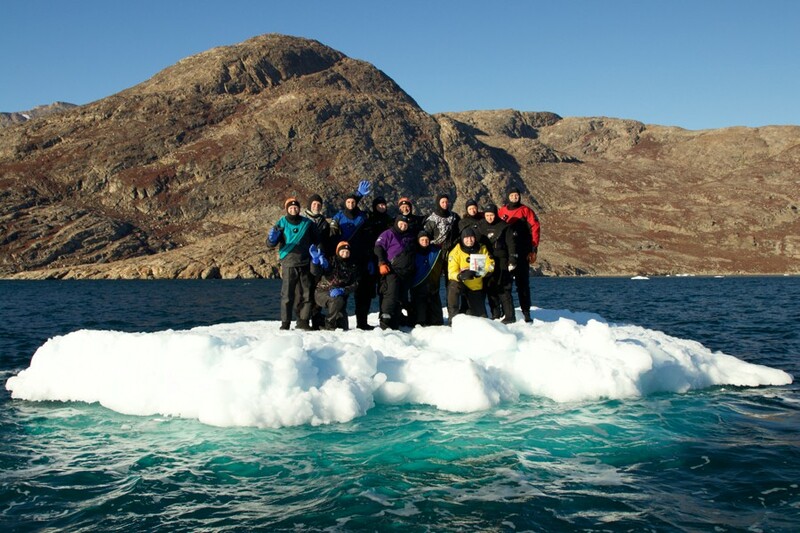 During the replenishment, some of our guests joined a shore party in search of Musk Ox. They had a brief sighting and we actually saw a small herd of Musk Ox from the deck of the Plancius. 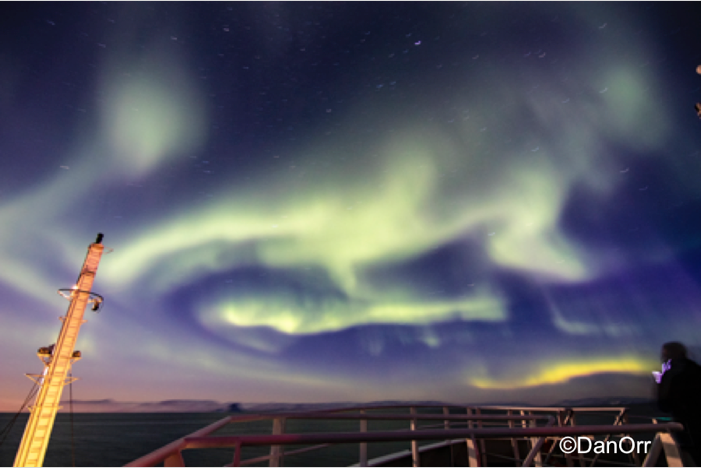 That evening, we had a BBQ on the BBQ deck and enjoyed another great meal onboard the Plancius. The crew of the Plancius were all first rate. 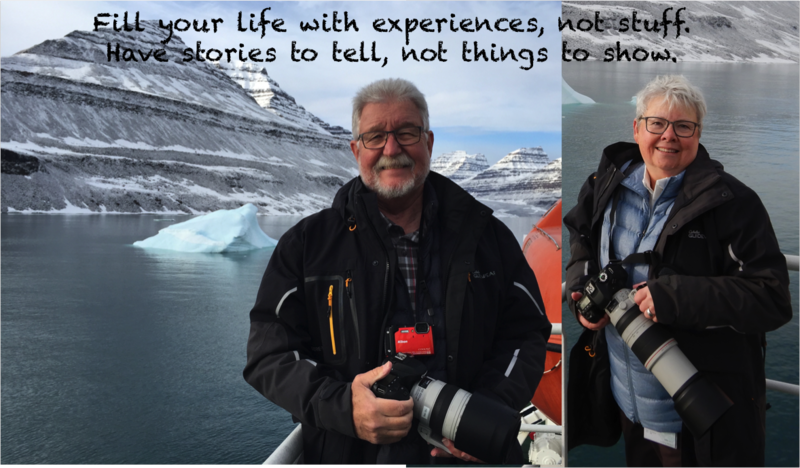 A few had been with us during the Antarctic Expedition in February. The accommodations were every comfortable and the food was well prepared and tasty. We thoroughly enjoyed our time about the Plancius. 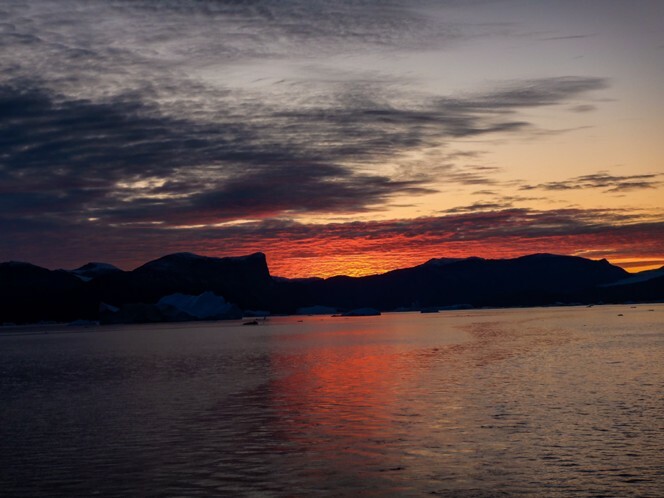 As the sun set on Greenland, the Plancius began its return trip to Iceland. Shortly after the sunset, the sky exploded with green and purple lights stretching from horizon to horizon seemingly bidding us a farewell from a true adventure to the Arctic! After a reasonably smooth return trip to Akureyri, we boarded a bus for a return trip to Reykjavik. During the return, we experienced rain, sleet and even snow! 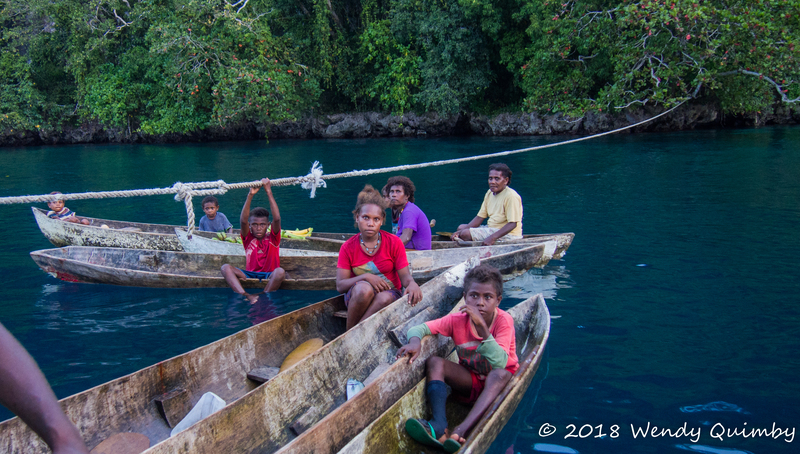 We stopped at the airport to drop off some of the diving guests who had flights home that day. The remaining guests were taken to local hotels for the night. 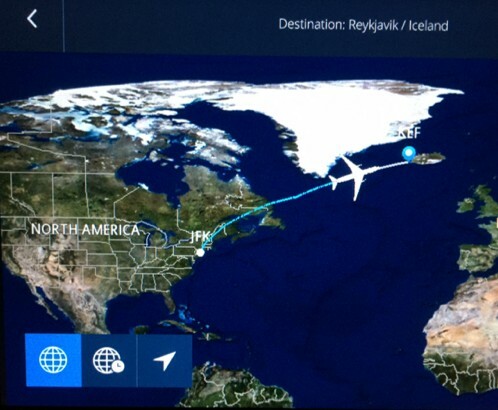 We stayed at the Hotel Keflavik and flew out the next morning. The 5 ½ hour flight was relatively smooth and we landed at JFK with a 3-hour layover before our flight to Salt Lake City (SLC) and then on to Jackson Hole. Our flight to SLC was delayed due to weather and once we were airborne, it was rough going across the US. We landed in SLC behind schedule with less than 30 minutes between flights. Luckily, our departure gate for Jackson Hole was just across the hall. We made our flight and landed in Jackson Hole at 9:30 PM. We gathered our luggage and started our hour drive home across Teton Pass arriving home around 11:30 PM after nearly 23 hours of travel. that will give us stories we will tell for years to come (most of which are likely to true!) and developed friendships that will last forever. It is truly a wonderful life!